The benefits of music on healing have been well documented. Music in the operating room is no different. Plastic Surgery and Music combine synergistically on many levels. Both embody the objective details of science and the subjective nature of art. Music can be documented on sheet music, but the performance depends on the artist, and the quality is ultimately judged by the audience. Similarly, the goals of plastic surgery can be described objectively; however, the paths and the outcomes are often subjective. Personally, I enjoy both. At age 15, I selected medicine for my career. At the time, I played clarinet and sax, and sang everything from English Madrigals to Punk Rock. During my pre-med training at UC Davis, I marched with the Cal Aggie Band-uh, and was Music Director for the campus radio station, KDVS. Through my career as a San Francisco Bay Area Plastic Surgeon in private practice in Walnut Creek, CA, I have continued my love of music. In 2011, my operating room musical selections were quoted in the article The Plastic Surgery Playlist: What Are Doctors Listening to in the OR? I enjoy music every day in the operating room. It provides a calming and cohesive environment for the surgical team and helps patients relax. 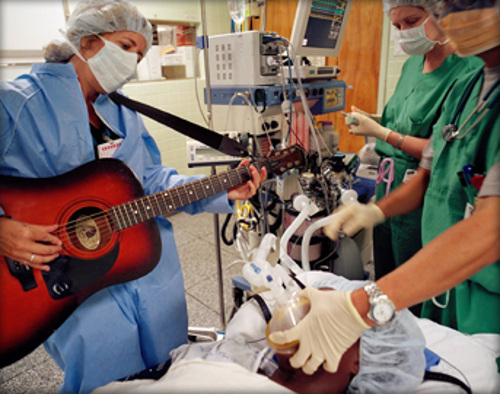 How about live music in the OR? The Louis and Lucille Armstrong Music Therapy Department at Beth Israel Medical Center has been supported by the Louis Armstrong Foundation since 1994. Music not just an enjoyable stress reliever, it improves surgical outcomes, an effect that can be objectively measured. In a recent Aesthetic Surgery Journal article, the positive influence of music on plastic surgery was proven. The study, from The University of Texas Medical Branch at Galveston, shows that when plastic surgeons listen to music they prefer, their surgical technique and efficiency when closing incisions is improved. This is regardless of the type of music played. I prefer a wide variety of music, and my playlists have been described as eclectic to the point of causing auditory whiplash. Variety is the spice of life, and outcomes are only improved when the plastic surgeon likes the music. For selected procedures, I have preferred play lists. For Blepharoplasty, I prefer classical. For Liposuction, something with a beat is helpful. For longer cases, upbeat music seems to keep the momentum of the operation moving forward. 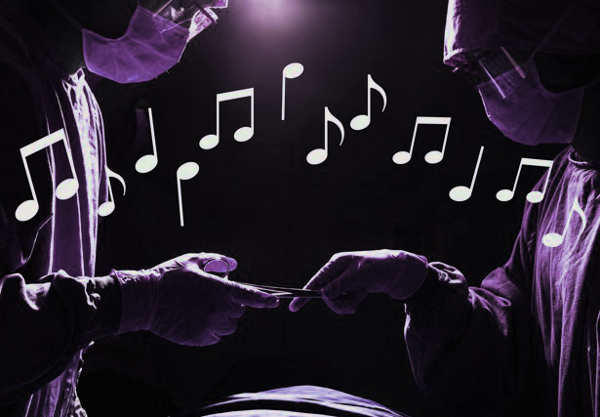 Previous studies show little objective correlation between the quality of surgical outcomes and whether patients like the music played during surgery. This makes sense, because when patients are under general anesthesia, there is no recall. Outcomes are not significantly improved when operating room team members other than the operating surgeon are asked to select the music, unless the surgeon likes it. However, subjectively, I feel it matters. A happy Plastic Surgery Team functions better, and has less resistance to doing more, when necessary. For patients, music is especially helpful during the pre- and post-operative experience. On the other hand, one study showed that when patients selected the music for their operation, and their surgeon did not like it, outcomes were worse! In the 90’s, carrying around a bulky case of CD’s was still worth it for good tunes in the OR. A study out of Buffalo, New York, published in the Journal of the American Medical Association in 1994, measured surgeons’ blood pressure and pulse rates during surgery. The data confirmed the quickest, most accurate performances, those with the lowest surgeon heart rates and blood pressures, came when surgeons listened to the music of their choosing. It was also demonstrated that it was better to have music selected by the study team than no music at all. In 1994, if you wanted to play music in the operating room it took some effort. You had to lug around your own CD’s, and often bring your own player to the operating room. Today ORs are bluetooth enabled, so all you need is your phone and a streaming service. Articles from the leading medical journals in the UK show that surgeon selection of music helps outcomes. In fact, the Guardian lists several doctors’ preferred playlists. Articles from the Lancet showed that compared with standard care, music was associated with a 20% reduction in postoperative pain, a 10% reduction in anxiety and a significant reduction in the use of pain medication. Music did not affect length of hospital stay, but it increased patient satisfaction slightly, so even hospital administrators might see the benefit. The nice thing about liking a wide variety of music is that your requests for music during Plastic Surgery are easily granted. With a variety of streaming music services like Pandora, Slacker and Spotify, access to music has never been easier. So if you have a favorite band or genre, let me know. For a Plastic Surgery Consultation in the San Francisco Bay Area give me a call at (925) 943-6353.